You might have heard or read about the ROCKI!. What is this ROCKI everyone speaks about ? Think audio output with team capabilities on the go. Yes, the ROCKI is not a big bulky boombox you need to have on a carriage to bring along. Portable, smart and neatly designed the ROCKI supports audio output via your Tablet,Smartphone, PC or even your amplifier at home . With Soundcloud integration and more to come in that field of operation. 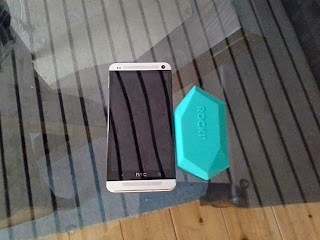 The ROCKI with HTC One. Cleverly enough the team behind ROCKI has gone longer than simply outputting audio. With the supporting app your friends can bring along their playlists and via the ROCKI the party is ready to be started. You can let your friends connect to your ROCKI and play their tunes . "With ROCKI you can have more than one phone controlling the music and create a music queue together"
There's a lot of potential in this one . Thanks to the WiFi playback option we dont have regular Bluetooth limitations here. As long as you are within the reach of your Wifi , there is tunes to be heard. 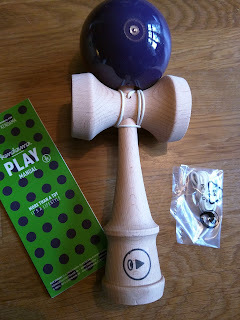 Go and Circle the ROCKI team on Google + and head over to their homepage for FAQs and more info. Last but not least, remember to visit the ROCKI kickstarter page. Keep your eyes peeled for a hands on review of the ROCKI on Androidistica!